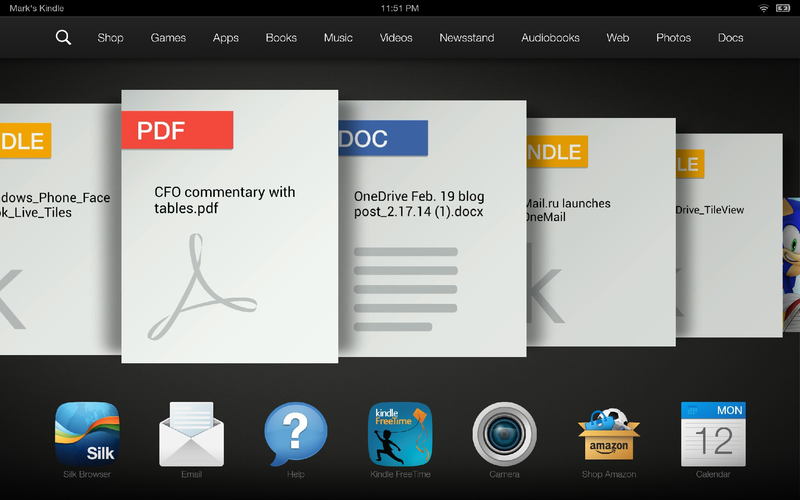 Amazon Kindle Fire HDX: Can a 'consumption' tablet deliver as a productivity machine? Microsoft is expected to launch a new competitor in the productivity tablet space on Tuesday, announcing what pundits are calling the “Surface Mini” at an event in New York. 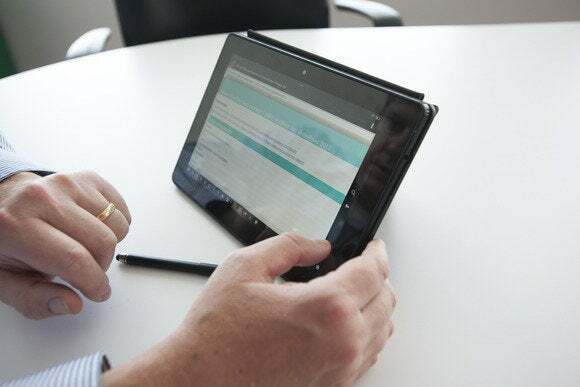 Conventional wisdom says the Surface Mini will come with a digitizer pen, thus mirroring the Surface Pro’s utility as a productivity device, but transporting the overall Surface promise—full-fledged Office apps on a tablet!—to a much more portable 7- or 8-inch form factor. Indeed, consumers have generally supported the move to smaller tablets. Among Surface Mini’s competitors will be the Apple iPad Mini, the Google Nexus 7, and the Amazon Kindle Fire HDX, which we compared to the Nexus 7 last year. Traditionally, these smaller tablets have been used for “consumption” activities: playing games, browsing the Web, and watching video. But on the eve of Microsoft’s launch, Amazon challenged us to use the Kindle Fire HDX in a new way—as a productivity machine. With the Surface Mini on the horizon, we agreed. Physically, the 8.9-inch Amazon Kindle Fire HDX is well-designed, but its size and weight are neither fish nor fowl. Physically, the Kindle Fire HDX I tested is well-designed, with one exception: It’s too small to qualify as a full-size tablet, yet too big for perfect portability. With an 8.9-inch display, the 13.2-ounce Amazon tablet is only slightly smaller and lighter than the $500 Apple iPad Air, which boasts a 9.7-inch display, weighs 16 ounces, and comes with 16GB of storage. Our Amazon review unit is also notably heavier than the $400 iPad mini, which has a 7.9-inch display, weighs 11.6 ounces, and comes with 16GB of storage. Our Kindle Fire HDX review unit, a Wi-Fi only tablet, is priced at $379 and includes 16GB of storage. Amazon says that its 2560x1600 display is 100-percent RGB color-accurate, and we have no reason to doubt that. While I was able to hold both the iPad mini and Kindle Fire HDX with one hand, the iPad mini is better suited for one-handed operation. The Kindle Fire tablet places both the power button and volume controls on the back—positioning that can be a challenge in some scenarios, like when you’re holding the Kindle in one hand and a stylus in the other. The Amazon Origami cover keeps the Kindle Fire HDX steady in either landscape or portrait mode. To better test the Kindle Fire HDX, we ordered Amazon’s official accessory, the Origami Cover, as well as a stylus. On first blush, the polyurethane Origami cover seems over-engineered and a bit precious. As the name suggests, you’ll need to fold it a couple of different ways to prop up the tablet in it, and it’s a bit tricky to get the hang of. Once folded, however, it’s surprisingly stable, in both landscape and portrait orientation. The Origami Cover lacks an integrated keyboard. So to use the Kindle Fire HDX as a productivity machine, you’ll need to make do with the software keyboard, or tote a separate Bluetooth keyboard whenever you want to get some work done. I really appreciate the Microsoft Surface for its integrated keyboard covers, so the lack of an integrated hardware keyboard is a strike against the Amazon tablet. Of course, keyboards don’t make any sense when carrying a smaller tablet around by hand. For these scenarios, you’ll want a stylus. For actual handwritten note-taking, I recommend one of two inking apps: either Handrite Notes or 7Notes. Both are available in premium and free versions. For digital inking, I prefer Handrite Notes, which allows you to scrawl notes in whatever size and orientation you prefer. Every time you lift your hand, the software then automatically resizes the word (or group of words), placing it just after what was previously written. 7Notes—specifically the $7.99 Premium Edition—includes a handwriting-to-text engine that can turn your notes into usable text. The latter also exports to Evernote and a number of other services. 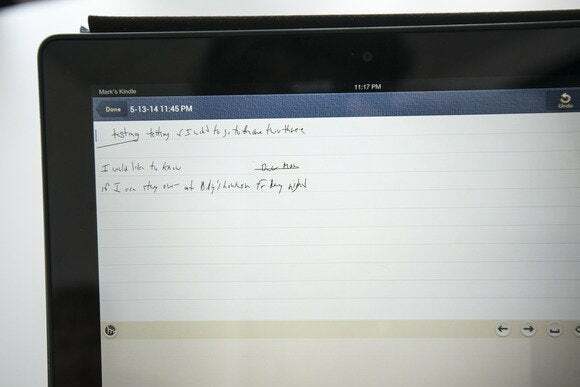 Taking notes using the Handrite app resizes your handwriting into a text-like size and format. Amazon has largely cut off the Kindle Fire HDX from the Google ecosystem, including the Google Play Store. On the positive side, Amazon offers most of what the Play Store offers (at least in terms of tablet apps), and it also offers one premium paid app per day, for free. So, if you’re vigilant, you may be able to pick up what you want without paying. Amazon also offers Kindle Fire users 500 Amazon Coins—a digital token that can be traded for cash, one Coin per cent at press time. On the negative side, Amazon makes it difficult to access Google Drive and other services within the Google ecosystem. If necessary, you can sideload these apps onto the tablet. The easier way is to use Google’s own mobile sites to access these services. The limitation with this approach, however, is that you can’t really download a Word file stored in Drive to your tablet. Instead, it will download as an HTML file, albeit with formatting preserved. Amazon’s UI puts recent documents, books, and other media front and center. 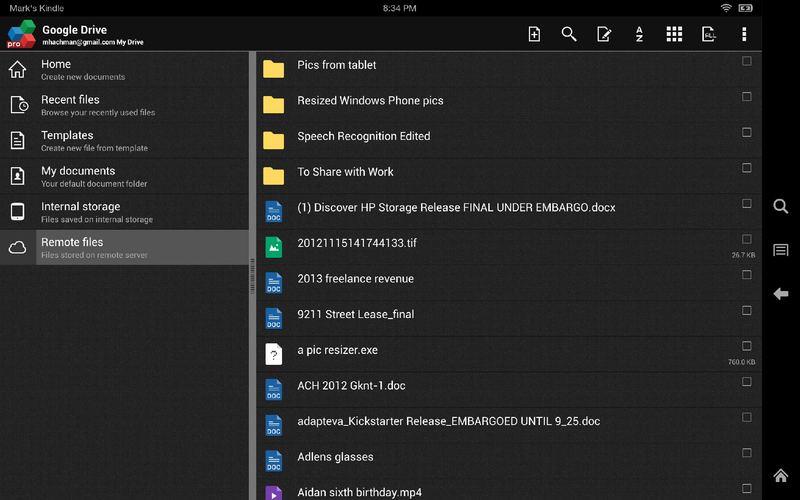 If you want to avoid Google Drive altogether, documents can be loaded onto the Kindle Fire HDX via a few other methods: by connecting a USB cable and physically transferring them; or storing a Web page for later perusal, or emailing them to yourself through what Amazon calls the Kindle Personal Document Service. 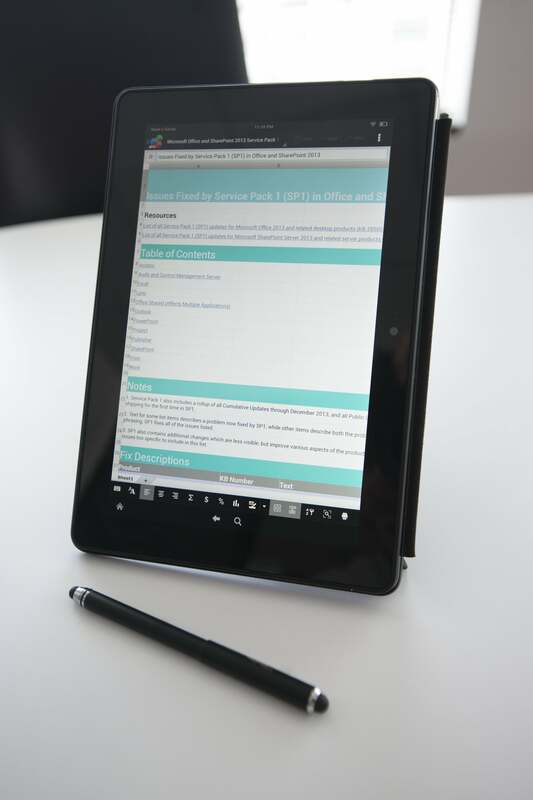 The latter capability stores and converts Office documents for you, but it's a legacy feature that you won't really need with a modern Android office suite, such as the OfficeSuite Pro app that's included with the tablet. Amazon says you’ll also get unlimited cloud storage space for all of your music, video and book purchases, but you can store only 5GB of your own documents in the cloud, as opposed to 15GB within Google Drive. 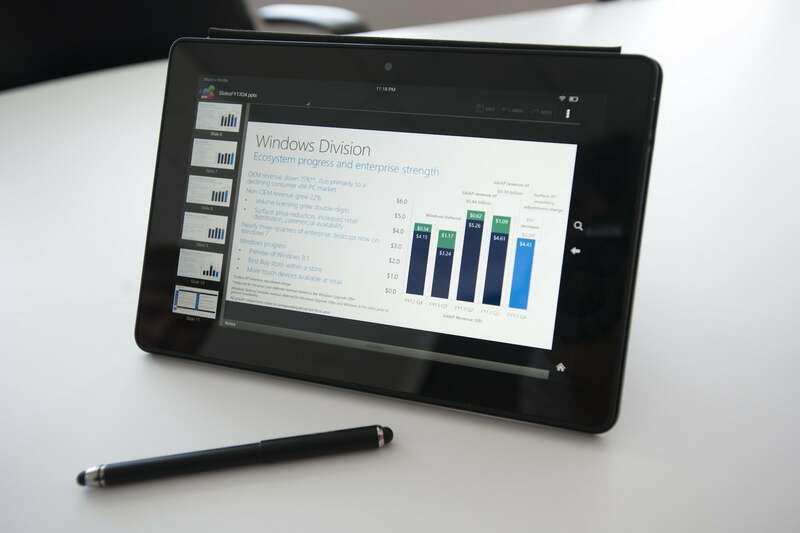 The Kindle Fire HDX has trouble with PowerPoint and Excel documents. If you double-tap such a document stored in the Amazon cloud, it will open as a read-only document. But if you’re working with locally stored documents, OfficeSuite Professional (an app that comes bundled with the tablet), will step in and open and edit the file automatically. OfficeSuite manages your files and documents, even those stored outside the Amazon cloud. In fact, OfficeSuite alleviates many of the roadblocks that Amazon puts in your way. Suddenly, you can access Google Drive, or Box, or any number of services, creating new files or editing files already stored there. You can also save them locally. OfficeSuite may not offer 100-percent compatibility with, say, Office 2013, but it’s a solid program that works with Word, PowerPoint, Excel and PDF files. Yes, you can choose to download other Android office suites that Amazon sells on its app store, but for many, the free bundled OfficeSuite Pro app will be all that’s necessary. 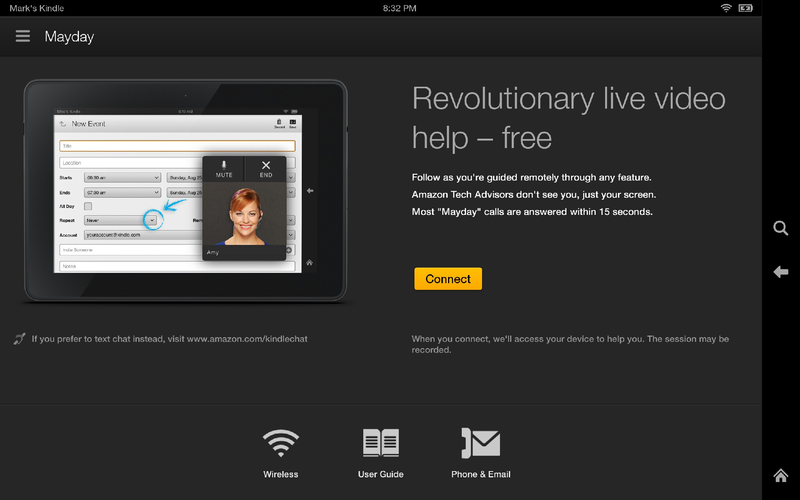 By the way, if you do have questions about how to use your tablet, Amazon’s built-in Mayday service can help in a pinch. Swipe down from the top of your screen and click the “Mayday” button; you’ll quickly be connected to an Amazon service representative who can see and control your screen, but not see you. The service rep I spoke to, Orlandus, clicked right through to the OfficeSuite app when I asked him how I could use my Kindle Fire HDX tablet to replace my Windows laptop while on the road, and gave me a brief explanation of how to move files from my PC by dragging and dropping them via a USB cable. It was probably easier and more effective than walking over to my IT help desk. So kudos go to Amazon for excellent customer support. Amazon’s Mayday service allows you to easily and quickly connect to a technical support person, via video, who can help solve your problems. Amazon’s one triumph is definitely Mayday, a customer and tech support hotline without the hotline. And if you’re using the Kindle Fire HDX as a two-handed device, I think you’ll quite like the Kindle Fire HDX hardware. But I’m not fond of the Kindle Fire’s user interface. Its carousel of frequently used apps and documents implies that the rest of the UI will be equally intuitive, but it’s really not. Unless you’re aware that swiping in from all three sides of the screen reveals different shortcuts and settings, you’ll be stumped. Amazon also throws up enough roadblocks—the walls it places between Google’s app store and services, its UI, the odd dichotomy between files stored in the cloud and on the device—that inevitably you’ll yearn for something simpler. For small Android tablets, Google’s Nexus 7 is still probably the go-to tablet until something better comes along. And if you’re an Apple fan, go back to your iPad mini. Basically, Amazon is in business to promote downloads of Kindle ebook and streaming movies via Amazon Prime. And from an entertainment perspective, the Kindle Fire HDX is excellent. Productivity, however, still feels like an afterthought.